we now have central air conditioning! 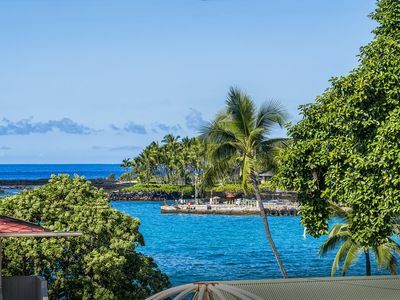 Kona has traditionally been Playground to Hawaiian Kings throughout history! 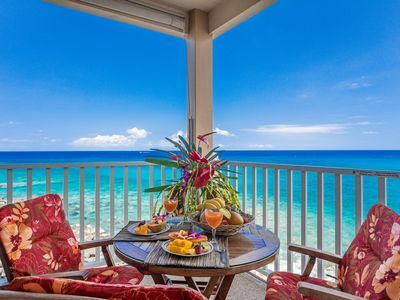 Situated directly on the ocean side of world famous Ali'i Drive, There is no better location. 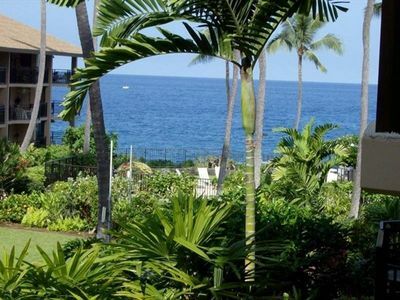 The amazing gardens of the 16 acre oceanfront resort are yours to wander through at your leisure. 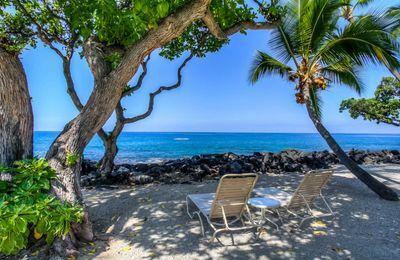 Walk from your lanai through the gardens, to the lava cliffs and listen to the crashing surf, and finish at the secluded private beach to watch the sunset. All without leaving the property! If you have a larger party to stay with us, we have additional nearby units, VRBO #4357550 and #4530998 available as well! 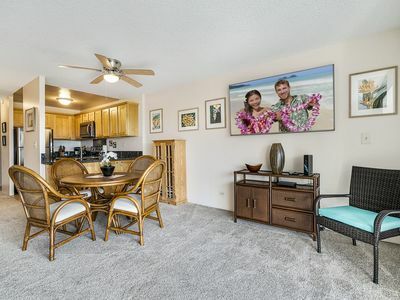 Our townhouse, built in the traditional Hawaiian style, has garden views and is just a short walk to the black sand and coral beach and the newly renovated pool. It is an end unit with no neighbors above or below. Parking space is right by the front door, so no lugging your bags into elevators or up flights of stairs. The full kitchen with dishwasher for those gourmet meals made with the local ingredients you picked up at the Saturday farmers market, just a block away. Full bath upstairs and down. Laundry is in the unit. 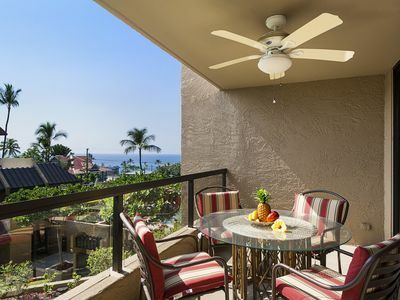 Ceiling fans throughout the interior with a portable air conditioning unit as well. 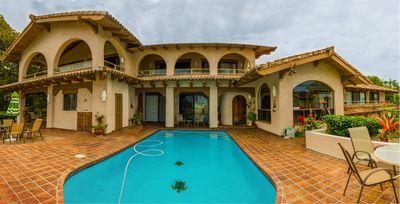 The windows feature a tropical louvre design to allow the cooling trade winds to flow through. Wireless internet, digital cable and a big screen LED TV keep you connected. 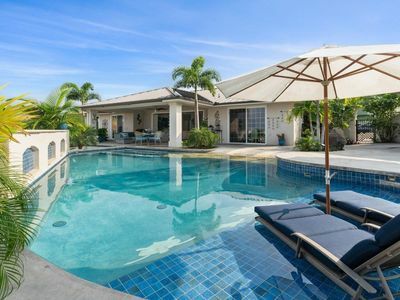 Tastefully decorated interior is comfortable with plenty of space to relax. The Master bedroom with a queen bed, overlooks the palms and gardens. The second bedroom has two twin beds. The first floor is tiled while upstairs is carpeted for your comfort. 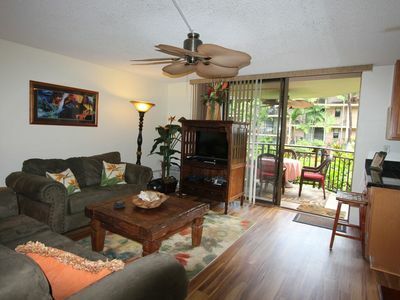 The relaxing lanai is surrounded by lawn, palms and mature tropical gardens. You can hear the surf pounding the cliffs just beyond. 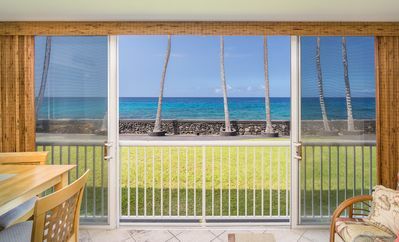 This makes the lanai my favorite place to drink Kona coffee in the morning, watching the native birds as they roam the grounds. 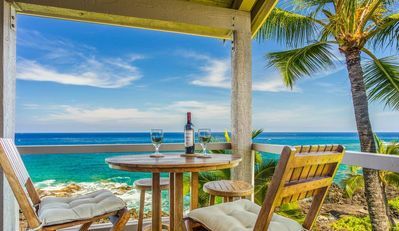 In the evening it is an amazing place to have a glass of wine and watch the sunset, if you don't feel like walking down to the beach. 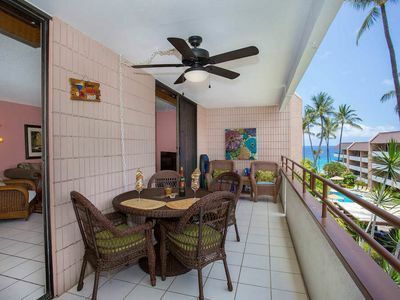 Bar-b-ques are placed throughout the complex with picnic areas for your use. On site tennis courts are free for use, just sign up. 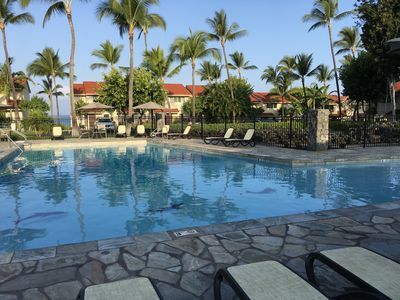 Oceanfront golf at the Kona Country Club is open the the public, and is adjacent to the complex to the south. I hear the clubhouse is fantastic! We have lots of beach gear, feel free to use it! 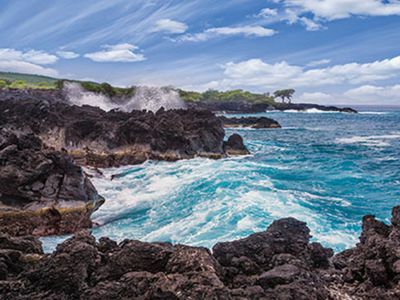 One of the best snorkeling beaches on the island is just a 5 minute walk up Ali'i Drive. It's also a great place to learn to surf. 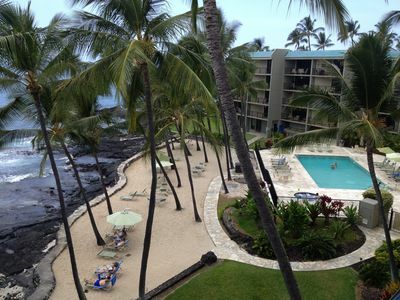 We are adjacent to Keauhou Bay, which is world famous for it's Manta Ray population. They come out nearly every evening. There are dive and snorkeling excursions where you can experience the thrill of seeing them in their natural habitat. 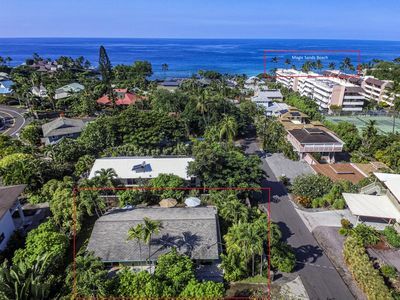 The Shops at Keauhou Center are just a block away, and have everything you might need with a grocery, drug store, restaurants, pubs and more! They host the Kamahameha School for Hula and other performances regularly. This is also where the Saturday Farmers Market is held. Visit Kilauea volcano, Kona and Kau coffee farms, macadamia nut farms, wineries, breweries, local farmers markets, national historic parks, great snorkeling beaches, black sand beaches, green sand beaches, white sand beaches, go surfing, visit thermal heated Champagne ools, waterfalls, botanical gardens, explore lava tubes, go whale watching, deep sea fishing, take a helicopter tour, a submarine tour, play a round of golf surrounded by the surf, go to an amazing oceanfront luau at the nearby Sheraton, or any number of other nearby adventures. The entire neighborhood is filled with the Spirit of Aloha... This is the real Hawai'i everyone is looking for. 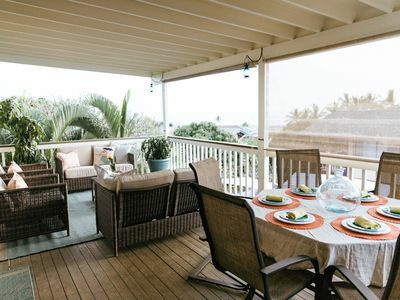 MIRACLE HALE is a family oriented home where you experience true ALOHA spirit. 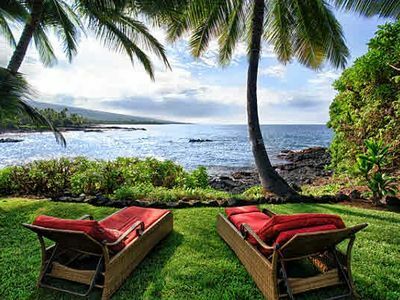 You’ll want to spend an extra week in Kona! 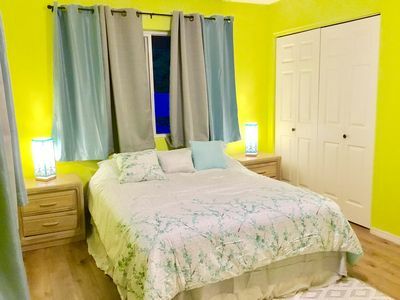 Recently Remodeled single level home minutes from Magic Sands Beach! 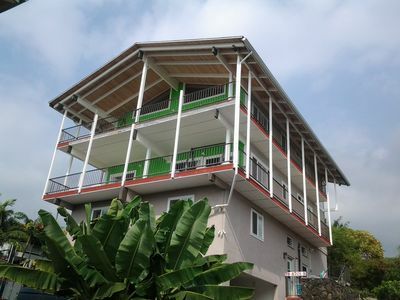 Perfect for Multi Family's...Perfect Location...Perfect Price!